The holidays are a time for visiting friends and family, celebrating with those we love and enjoying the excitement of the sights and sounds of the season. For our pets, however, this time of year can be distressing if not outright dangerous. Keep your pets happy and safe this holiday season by keeping these tips in mind. While it’s tempting to give your pets table scraps, cookies and other treats off the table, it isn’t a good idea. Their digestive systems aren’t built for the high fat, high sugar foods we eat. A few small pieces of low-fat, unseasoned meat are all you should give your pets. And don’t forget to let your guests know not to give your furry friends any treats off the table. Most importantly, do NOT give alcohol to your pets. It can be poisonous and the smaller size of pets mean it can take just a few sips to make them seriously ill. Chocolate is particularly dangerous to pets, so keep it high enough that pets can’t get to it. The Humane Society of the United States has a list of the most common foods that pets should avoid. With lots of people in and out of the house and the occasional treat will mean your pets will be thirsty. Colder weather means animals have to work harder to stay warm and they’ll need more water. Check their water bowls filled with cool (not cold), fresh water. Decorating your home for the holidays is festive and fun and will naturally make dogs and cats curious. Be sure to keep dangerous décor like candles out of reach; a stray tail could catch fire. Wreaths, mistletoe, holly and pine needles can all cause dangerous problems. Sweep up loose needles frequently. Delicate glass ornaments, tinsel and ribbons should also be kept out of their reach. They could mistake new and interesting items for toys or treats. The extra noise, lights and activity can make animals apprehensive. Set aside a room where they will be comfortable and place fresh water, a few favorite toys and a bed or blanket in it. Show them that this is their retreat. If your dog is crate-trained, move his crate to a quieter area of the house a week or two in advance of house guests so that they will get used to the new location and not mistake it for punishment. Birds in particular don’t respond well to too much noise or light. They need at least eight to ten hours of sleep, so remove them from rooms where it will be rowdy until the late hours. Covering their cage will also help calm them. A new toy can be distracting and help them adjust. If you can, have your pet micro chipped. Pets can quickly slip out of a door left open, and it takes only a minute for them to bolt if frightened. If micro chipping isn’t an option, make sure your pets’ ID tags are securely fastened and easy to read. Even the best pet parents can let pet routines slide during the hustle and bustle of the season. If at all possible, don’t let this happen. The joy of their daily walk or quiet time in the evening for cuddling are important to pets, so don’t neglect them. Losing these moments will stress them even more. Many people are nervous around exotic pets such as snakes and lizards. The time to try to bring them together with your pets is not at the holidays. Both people and pets are more stressed and forcing them together could bring disastrous results. Respect your pets’ and your guests’ comfort boundaries. Icy sidewalks and heavy snow are treacherous for pets. Snow can get caked between their toes, leading to discomfort. Slipping on ice can lead to falls and sharp shards of ice can cut their pads. If you use ice melt, be sure it’s a non-toxic ice melt that won’t burn their pads. There are newer formulations on the market that are safe even if pets ingest some of it. Kids who aren’t used to pets can become over excited. They may handle your pets roughly or squeal in a way that’s unnerving for animals. Be sure they are shown the proper way to interact with your pets and supervise them closely. 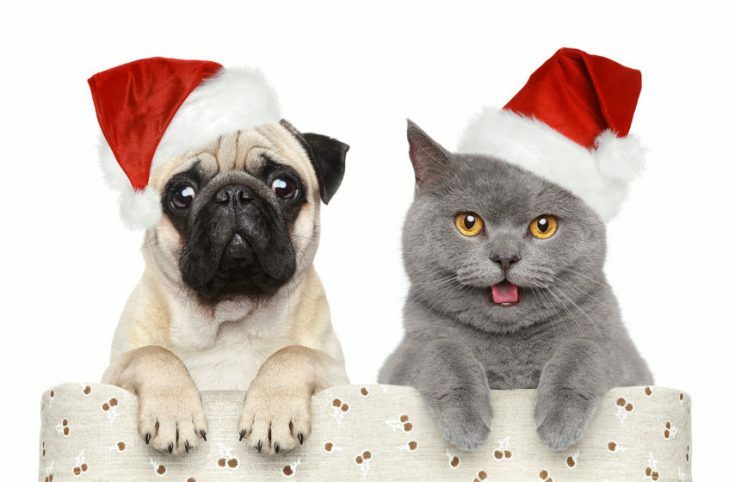 Don’t forget to give your pets an extra dose of love this holiday season so that everyone enjoys the festivities!